This website shares scientific, archaeological research conducted with support from a National Science Foundation (NSF) Grant (Anthropology Program, BCS-1430754) to Co-Principal Investigators Dr. Sarah Neusius, Indiana University of Pennsylvania, and Dr. Bonnie Styles, Illinois State Museum. From 2014-2017, Drs. Neusius and Styles co-directed the research project and addressed two major goals. 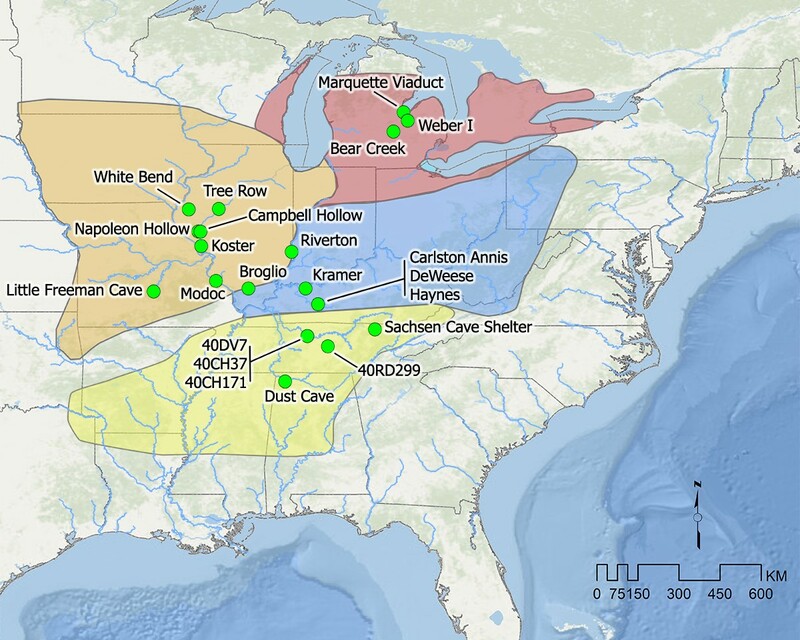 The first goal is to preserve and make accessible zooarchaeological databases from important Archaic Period (10,500-2,500 RCYBP) archaeological sites in the interior North American Eastern Woodlands (see map below). The second goal is to analyze these datasets to test hypotheses about the roles of environmental and cultural variability and changes on human use of animals during this time period, particularly the use of aquatic resources. We thank Frank McManamon, Executive Director of Digital Antiquity, and Adam Brin, Director of Technology for Digital Antiquity, who were instrumental in the development of the Digital Archaeological Record. We also thank Kate Spielmann and Keith Kintigh, who led the integration of zooarchaeological data in tDAR and served as advisors for our project. We established the Eastern Archaic Faunal Working Group (see list below) to undertake this collaborative project. This group uploaded and preserved about 60 faunal datasets for 24 Archaic Period sites in the Digital Archaeological Record (tDAR). An international repository of digital data, images, and documents, tDAR (www.tDAR.org) is maintained by Digital Antiquity and hosted by Arizona State University. We chose to upload our data into tDAR because of the digital archiving capability and long-term commitment of Digital Antiquity to preserve and provide open access to the data. We used the mapping and integration tools in tDAR to compare datasets developed by different researchers using different formats. Our databases are now released in tDAR and are accessible to researchers across the world. This map shows the study area, subregions, and Archaic Period archaeological sites included in our NSF-funded grant project. In 2015, Co-Principal Investigator Sarah Neusius took this image of our team at one of our initial NSF-sponsored workshops at the Illinois State Museum (lower image). Pictured from left to right are Steve Kuehn, George Crothers, Adam Brin (Director of Technology, Digital Antiquity, Arizona State University), Tanya Peres, Bonnie Styles, Renee Walker, Alan Huber (Indiana University of Pennsylvania), Beverley Smith, and Mona Colburn. The face-to-face meetings were critical to our project. They provided the training needed for the whole team to become familiar with tDAR and to learn how to best prepare our individual datasets for ingestion into tDAR. They contributed to consistency in how each of us mapped attributes for variables in our individual datasets to the attributes in the shared ontologies. They provided the time needed to discuss problems and make observations. Finally, they were essential to addressing our research hypotheses and the development of publication and future research plans. In January 2017, our research team participated in a workshop on our project at Florida State University (left image above). Pictured from left to right are George Crothers, Mona Colburn, Sarah Neusius, Tanya Peres, Beverley Smith, Renee Walker, and Bonnie Styles. George Crothers hosted a post-grant workshop at the Hamilton Valley Cave Research Foundation facilities at Mammoth Cave National Park to prepare the final report and publication plans. This meeting included a short hike to the entrance of Salts Cave (center image above, taken by Renee Walker). Pictured are George Crothers (back row) and Renee Walker, Bonnie Styles, Tanya Peres, Sarah Neusius, and Beverley Smith (front row). An after-hours tour of Mammoth Cave by George Crothers provided added stimulation (right image above). 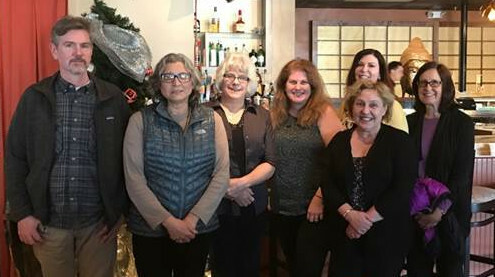 Pictured from left to right are Beverley Smith, Bonnie Styles, Sarah Neusius, Tanya Peres, George Crothers, and Renee Walker. We thank the National Science Foundation for supporting our research project and the development of this website. This website introduces the general public to the science of zooarchaeology and what we have learned from the bones and shells from archaeological sites. The examples provided stem from the research undertaken for the NSF grant with a focus on interpretations from the Koster site and Modoc Rock Shelter in Illinois. The website is designed for the general public and to be accessible to students from seventh grade through undergraduate college. Website Funding: National Science Foundation, Anthropology Program (BCS-1430754): “Adaptation and Cultural Practices During the Archaic Period in the Interior North American Eastern Woodlands: Creating and Integrating Digital Faunal Databases in tDAR,” Co-Principal Investigators, Dr. Sarah Neusius, Indiana University of Pennsylvania, and Dr. Bonnie Styles, Illinois State Museum.